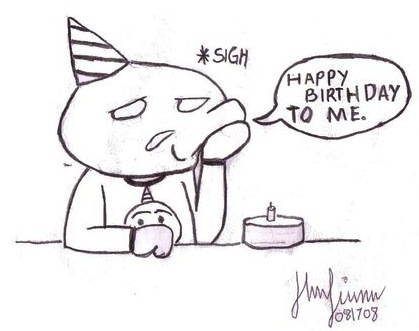 In the past few years, maybe since I turned 30 exactly, I have not become a fan of my Birthday. I know maybe it sounds weird. Most people embrace it, but since then I feel like Bill Crystal in City slickers. I’ve said for 9 years now I really hate the “5’s” and the “0’s” and I can usually deal with the numbers in between. Today though feels different. Maybe now I am not a fan of the “9’s” because it means the “0” is only 12 months away and I dislike that one more than most. I remember when I was a kid, like everyone else I loved my birthday. It was great since it was so close to christmas, although every once in a while I got the “this is for Christmas and your Birthday”. So why do you ask am I not a fan these days? Don’t get me wrong, I love my life. I love where I have come from, I love who my parents made me into. I love my wife and everything about her. The thing about it is that people who know me, also know I spend a lot of time reflecting, and today is no exception. I reflect on the positive of the past, and I also think about the misses as well. It’s a time for looking back as well as looking forward. I mean hell, I FEEL better today than I did 15 years ago, and for that I am very thankful. As I have gotten older I started thinking less about myself and more about how to pay it forward. When we are young, it’s always about “number one”, and people know I was that guy for sure. I would never have thought twice about helping anyone out. In the last 9 years I have become more focussed not only on myself, but on paying it forward where I can. I’m a true believer in karma. I also wonder year over year as I have posted in the past, “What’s my purpose?” I truly have started to believe that we all have opportunities in life to do great things. To be part of something different. Seth Godin speaks of how we are all “Weird” in our own rights, and I love that. The difference is there are those that embrace it and those that don’t. I’ve spent a good part of my last year trying to embrace it even in the face of adversity. The last year of my life has been different from previous ones. I don’t know where it went! It went by so fast because I was so busy. I think that’s why today makes me think because I realize how fast things went by I wonder what I missed! Seriously, sometimes we go through live at a crazy pace we miss a lot. I know I did a lot, but I also wonder what opportunities I missed. Did I miss a chance to help someone around me? Did I miss a chance to say I love you to my wife? Did I miss something that could have changed my life or someone else’s around me. I have also spent a lot of time starting to surround myself with more positive people. I have some goals to listen to more Seth Godin Audio books, and continue to grow and add new friends to my circle that are more positive. What I realized in the last year of my life is I got dragged down in to the negative of people around me who we all have. We will always have doubters and haters around us and as I get older I realize life’s too short to let those people drag us down.